Viewing 8:00 - 9:00 am Discussion 9:00 - 10:15 am. This small exhibit highlights protest posters from the 1980s and 1990s, including those of the organization Physicians for Social Responsibility opposing the neutron bomb. Pop-Up Exhibit: Revolutionary Public Health Campaign, September 27, 4-6 p.m.
Read more about Pop-Up Exhibit: Revolutionary Public Health Campaign, September 27, 4-6 p.m. The Atlas of Skin Diseases was among the first publications undertaken, in 1859, by the New Sydenham Society. Time-consuming and costly to produce, it was issued in seventeen parts over a period of twenty-four years. “Combat Art,” created by designated soldier artists, was widely exhibited during World War II and also illustrated popular publications such as LIFE magazine. Clements C. Fry, Yale psychiatrist and collector, purchased this drawing in 1946 after having seen it in an exhibition in Washington, D.C., where he served on the National Research Council. We've Still Got A Job To Do! Read more about We've Still Got A Job To Do! 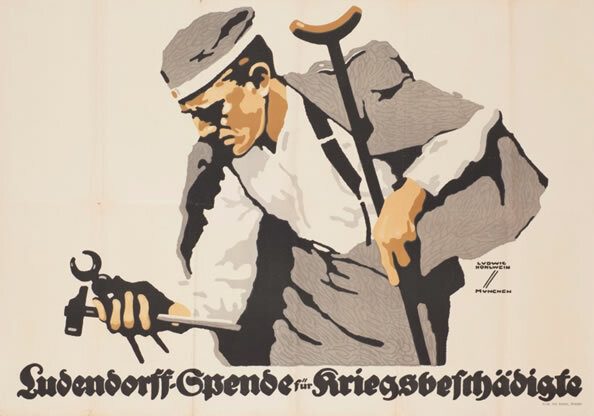 Eyewitness renderings of medicine in the field during World War I and World War II, together with posters from various wartime agencies, show part of the war experience and its effect on individuals. On view in the Hallway September 22 through January 14, 2013.